was still some left. The judges then announced “In 2nd place is ... Hymers College!”. Screaming, we ran down to the stage. All the other groups were much bigger but we screamed much louder than all of them. We were overwhelmed and could not wrap our heads around the fact we were second. After taking a moment to realise what had just happened we found out that we were going to the next round and were dancing in Oxford! was that we were second. Mr Doyle kindly took us all out for ice cream afterwards. We knew we had to get practising straight away if we were going to do well at Oxford. We tweaked and improved our dance. The only question was had we done enough work to get placed at Oxford? Well we were only a bus journey away to find out and this time we were more eager to win. I came off stage I was completely out of energy. 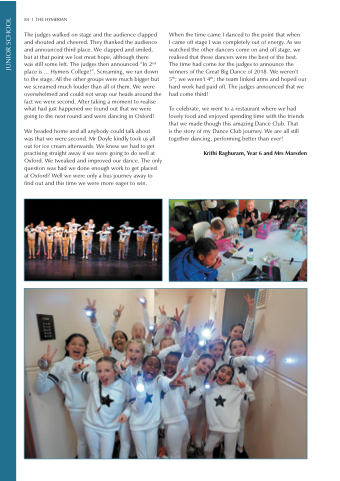 As we watched the other dancers come on and off stage, we realised that these dancers were the best of the best. The time had come for the judges to announce the winners of the Great Big Dance of 2018. We weren’t 5th; we weren’t 4th; the team linked arms and hoped our hard work had paid off. The judges announced that we had come third! is the story of my Dance Club journey. We are all still together dancing , performing better than ever!